What companies are capable of doing this? Google, Apple, Dish Network, DirectTV or Comcast who have complimentary interests in the TV business. Dish Network recently purchase Sling Box which is a phenomenal product for viewing your home live TV from on your phone. I use Sling Box with Verizon FiOS on my T-Mobile 4G phone currently and love it. Watching and controlling your TV from your phone is a great experience even from the moving car. Especially, when you are grandfathered into an unlimited data plan. Is the AT&T + T-Mobile merger about scarcity of spectrum or do they really want T-Mobile price sensitive customers who will likely leave? The spectrum allocation scarcity issue has been wildly mismanaged and created by the FCC. In other countries around the world spectrum is shared and works much better. However, spectrum hoarding has become a business to fend off competition and keep prices artificially high. Thus the reason why the U.S. needs 4 large carriers to keep the industry competitive and price sensitive. Having two CDMA (Verizon & Sprint) and two GSM carriers (AT&T & T-Mobile) is the key to making competition thrive and without this consumers will lose. If you are a customer on T-Mobile using their HSPA+ network the experience is quite good if you live in an area that has coverage. The fewer people around you competing for coverage at the tower means the better bandwidth and coverage you have on your phone. As a T-Mobile customer you are competing against 30M people vs AT&T or Verizon who have 90M people. More people = more spectrum required to make all of your data hungry users happy. Enter Light Squared into the carrier equation in the last few years which is trying to build out a satellite network that would provide 4G LTE coverage. Light Squared is a dramatically new way of thinking for a telecom industry which seem incessant on resisting change and protecting their turf. The turf they are protection are the billions invested into tradition cell phone tower networks. Light Squared is disrupting the traditional cellular network by deploying 4G LTE coverage via satellite networks. In theory, this means better coverage in remote areas that traditionally not reached by cell phone towers. 1) There are too many old school organization members that are trying to protect turf. 2) The lobbying groups behind the organization have conflicts of interest? 3) Light Squared paid for spectrum and now they are being prevented to use it? 4) It seems like the sole purpose of the organization is to destroy a company Light Squared that is doing something very disruptive in the communications space. 5) Light Squared has no customers yet and has not been tested in the real world. 6) Please share other reasons this organization might be a fraud below. Here is how the organization describes itself and you can read more at Saveourgps.org. Representatives of a wide variety of industries and companies have joined a "Coalition to Save Our GPS" to resolve a serious threat to the reliability and viability of the Global Positioning System (GPS). A national utility upon which millions of Americans rely every day. To safeguard GPS, the Coalition seeks a number of remedies from the Federal Communications Commission (FCC), which recently granted a waiver to a company called LightSquared that allows them to repurpose the satellite spectrum immediately neighboring that of the GPS. LightSquared plans to transmit ground-based radio signals that would be one billion or more times more powerful as received on earth than GPS's low-powered satellite-based signals, potentially causing severe interference impacting millions of GPS receivers - including those used by the federal agencies, state and local governments, first responders, airlines, mariners, civil engineering, construction and surveying, agriculture, and everyday consumers in their cars and on handheld devices. Here are some of the member organization trying to block the use of spectrum for to improve cellular coverage in remote areas that don't have cell towers. Apple, HTC, Samsung, Motorola, AT&T, Sprint, T-Mobile and Carrier IQ Sued in Delaware Federal Court in Cell Phone Tracking Software Scandal. WILMINGTON, Del., Dec. 2, 2011- The law firms of Sianni & Straite LLP of Wilmington, DE, Eichen Crutchlow Zaslow & McElroy LLP of Edison, NJ, and Keefe Bartels L.L.C. of Red Bank, NJ, have today filed a class action complaint in Federal Court in Wilmington, Delaware related to the unprecedented breach of the digital privacy rights of 150 million cell phone users. The complaint asserts that three cell phone providers (T-Mobile, Sprint and AT&T) and four manufacturers of cell phones (HTC, Motorola, Apple and Samsung) violated the Federal Wiretap Act, the Stored Electronic Communications Act, and the Federal Computer Fraud and Abuse Act. The carriers and manufacturers were caught last month willfully violating customers' privacy rights in direct violation of federal law. A technology blogger in Connecticut discovered that software designed and sold by California-based Carrier IQ, Inc. was secretly tracking personal and sensitive information of the cell phone users without the consent or knowledge of the users. 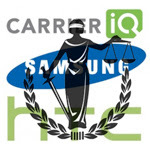 On Nov. 30, 2011, the United States Senate Committee on the Judiciary said in a letter to Carrier IQ that "these actions may violate federal privacy laws." It added, "this is potentially a very serious matter." David Straite, one of the attorneys leading the action, noted "this latest revelation of corporate America's brazen disregard for the digital privacy rights of its customers is yet another example of the escalating erosion of liberty in this country. We are hopeful that the courts will allow ordinary customers the opportunity to remedy this outrageous breach." Steve Grygiel, co-counsel for the proposed class, agreed: "anyone who cares at all about their personal privacy, or the broader constitutional right to privacy, ought to care and care a great deal about this case." Barry Eichen added, "today's comment from Larry Lenhart, CEO of Carrier IQ, that his software is somehow good for consumers starkly demonstrates what is at stake." A copy of the Class Action Complaint in Pacilli v. Carrier IQ, Inc. can be viewed on the Firms' websites at www.siannistraite.com, www.keefebartels.com, and www.njadvocates.com. Plaintiffs are represented by Sianni & Straite LLP, a Delaware-based litigation firm with a branch office in New York, Keefe Bartels LLC, a New Jersey-based plaintiffs' rights trial law firm, and Eichen Crutchlow Zaslow & McElroy LLP, a leading plaintiffs firm with three offices in New Jersey. Does this Consumer Reports survey of 66,000 people have any credibility for a cell phone service shopper? This survey represents a narrow demographic of respondents. Even Consumer Reports states their “Findings might not reflect the general U.S. population.” Also, it is indeed a survey and does not contain any empirical testing of the type that has made Consumer Reports the respected entity it is today. But the main reason these results are not meaningful, or fair for that matter, is the lack of information regarding smartphone users vs. old school phone users, broken down by the wireless provider being rated. Why is this important? 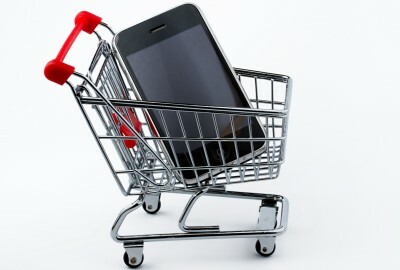 Smartphones demand a much higher quality of service and bandwidth to operate. Even Consumer Reports implies that users who use their wireless devices primarily for talking and texting (non smartphone customers) are easier to please than those who have smartphones, who require more demanding tasks such as web surfing and watching videos. Consumer Reports does not provide any data as to which providers in the survey were rated by smartphone subscribers vs. non smartphone subscribers. Thus, their results are comparing apples-to-oranges. For example, is it meaningful or fair to compare Provider A who, for example, was rated by customers who primarily use smartphones vs. Provider B, who was rated by customers who primarily use non smartphones? I think not. Based on my years of running this web site, I can conclude that some wireless providers have a larger percentage of smartphone subscribers than others. These smartphone subscribers are, by nature, sophisticated, demanding and particular. Other providers have a larger percentage of non smartphone subscribers who are typically lower paying, less sophisticated customers who are happy with status quo and using older phones. These customers, of course, would be happier with their service. My take? Consumer Reports should divulge the percentage of smartphone and non smartphones subs rating each wireless provider. This key information would allow readers to make fair and meaningful comparisons. Deadcellzones.com surveys an audience of similar size of 60,000 but does so on a monthly basis. Thus we survey an audience that is 10 times larger than consumer reports. DCZ also provide searchable maps with very specific geographic information about coverage problems. Ask yourself which is more useful as a consumer shopping for service in your area? Connecticut-based systems administrator Carrier IQ has found itself in hot water of late. Gizmodo recently broke the story that revealed how the company tracked information on most Smartphones without users’ knowledge or ability to opt out. This revelation came to light via the YouTube video posted by Android developer Trevor Eckhart which demonstrated that Carrier IQ circumvents web encryption to pick up on passwords, Google queries, and other web activities. Predictably, wireless customers have been outraged, and carriers themselves have sought to distance themselves from the company. 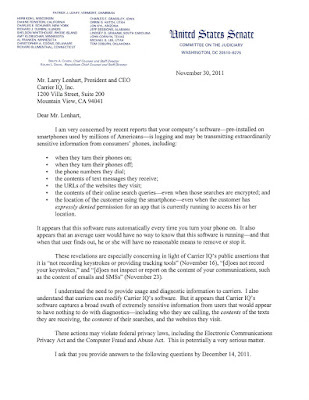 Furthermore, Senator Al Franken sent Carrier IQ CEO Larry Lenhart a stern letter warning of possible legal action and demanding explanation by December 14. CIQ has recently come to its own defense, however. 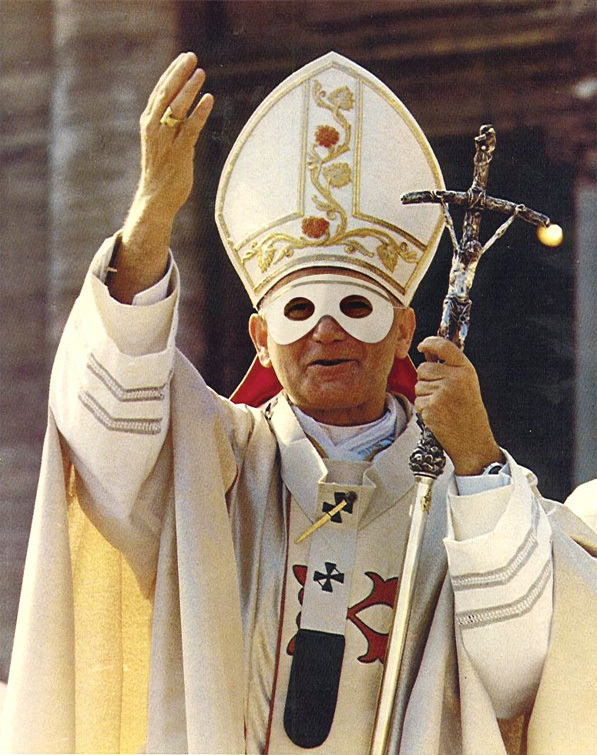 They are insisting that their intentions are altruistic rather than malevolent. The company released a statement assuring the wireless community that they do not store SMS messages, e-mail, photos, audio, or video recordings. "We measure and summarize performance of the device to assist Operators in delivering better service," they explained. Additionally, CIQ has claimed that the monitoring operations they undertake are totally on the behest of the carriers. Andrew Coward, CIQ’s VP of Marketing told The Wall Street Journal’s All Things D that, while the software listens for specific, keystrokes to send diagnostic information to the carriers, they are not privy to the actual message. They claim to ignore your personal information but still have access to it. Coward also maintained that CIQ does not share the data with any 3rd party operators, and thus consumers have nothing to fear. U.S. 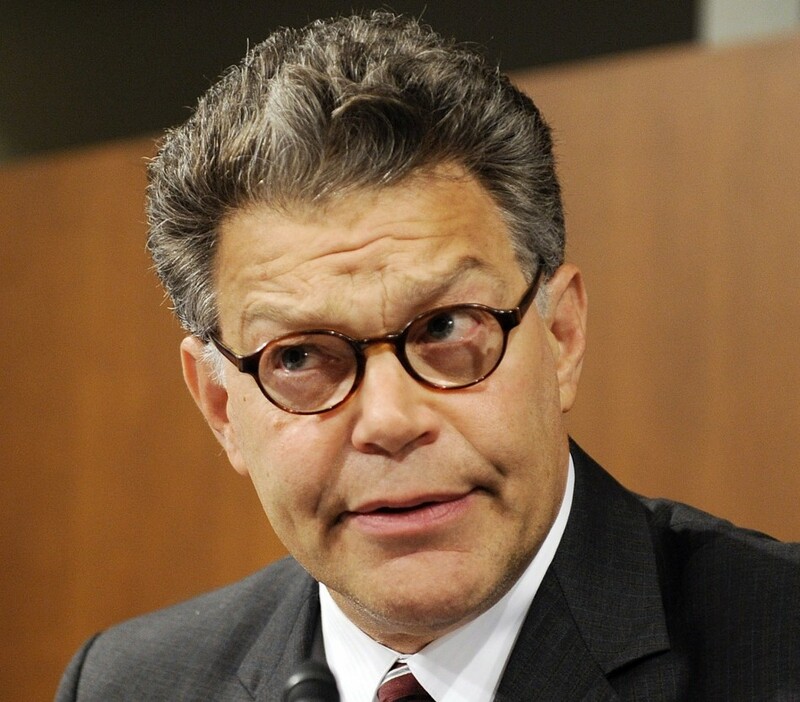 Senator Al Franken just sent Carrier IQ a nasty letter. 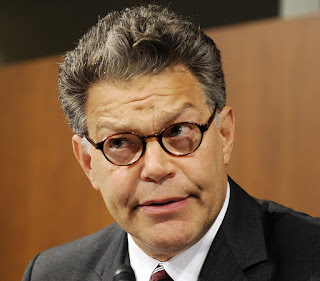 Today Franken fired off a letter to Carrier IQ CEO Larry Lenhart raising questions about the company's practices and demanding answers by December 14. 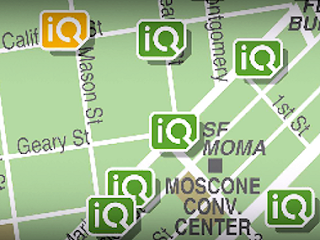 Earlier this week a story was launched by Gizmodo that Carrier IQ is Secretly Recording your Mobile Phone Actions. It appears the Carrier IQ software captures a broad swath of extremely sensitive information from users that would appear to have nothing to do with diagnostics—including who they are calling, the contents of the texts they are receiving, the contents of their searches and the websites they visit. 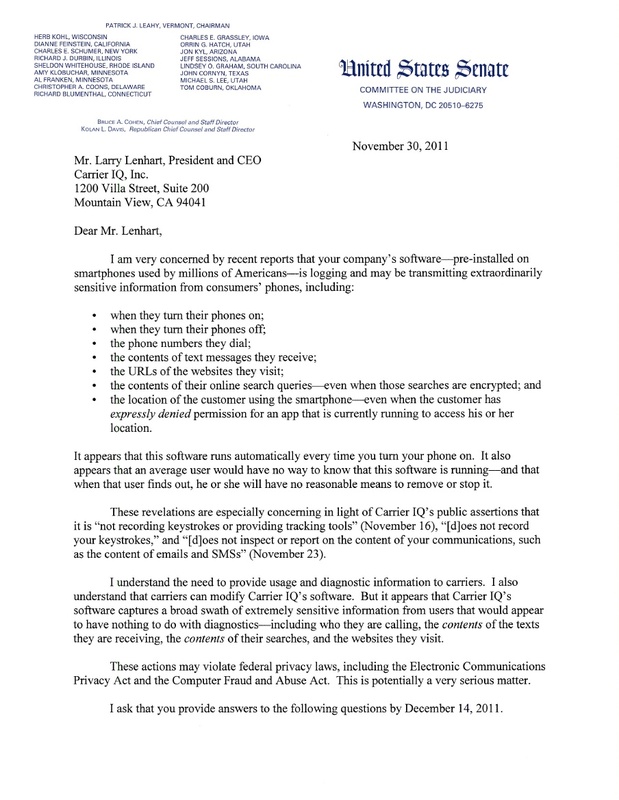 These actions may violate federal privacy laws, including the Electronic Communications Privacy Act and the Computer Fraud and Abuse Act. This is potentially a very serious matter. Read the letter below. Click to enlarge. 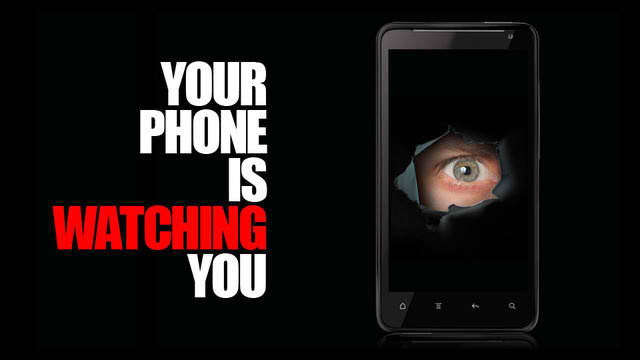 If you have a newer Android phone, everything you do is being recorded by hidden software lurking inside. It even circumvents web encryption and grabs everything—including your passwords and Google queries. Worse: it's the handset manufacturers and the carriers who—in the name of "making your user experience better"—install this software without any way for you to opt-out. This YouTube video, recorded by 25-year-old Android developer Trevor Eckhart, shows how it works. This is bad. Really bad. 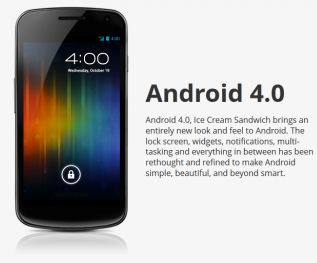 See details of this article first posted by Gizmodo. 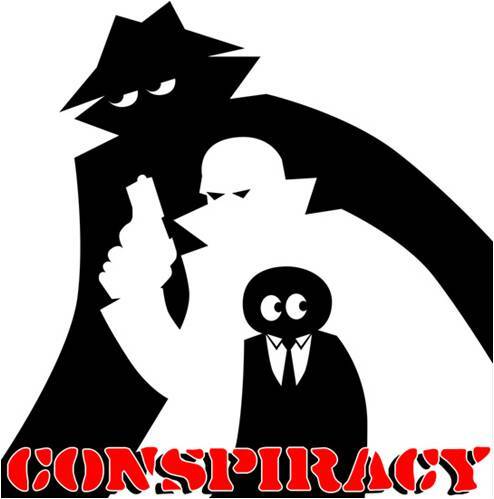 The spying software is developed by a company called Carrier IQ. In their site, the company says they are "the only embedded analytics company to support millions of devices simultaneously, we give Wireless Carriers and Handset Manufacturers unprecedented insight into their customers' mobile experience." Is this the best way to track user experience, dropped calls and coverage problems? I think there is a better way and Deadcellzones.com has demonstrated that consumers are capable of reporting problems directly to a web site if given the resources to do it. Carrier IQ is a well funded VC backed company that tracks billions of anonymously reported coverage problems and dropped calls by passing along this data directly to the carrier. The receive millions of dollars per year from carriers to track this. However, does the carrier even do anything with the data despite the reported issues? Is this the classic "deer in headlights" problems with billions of reception problems reported. Isn't there a better way to prioritize the problems people are experiencing? How about try crowdsourcing coverage problems from actual customers. Deadcellzones.com is certainly a model to start thinking about. For anyone who rushed out and purchased a brand new iPhone 4S, they were greeted with several new and innovative features. The new iCloud provides all Apple users a chance to access the company's infrastructure as a service options from any device they own. Siri became the talk of the town when its artificial intelligence capabilities were announced. The camera on the 4S model even got a major upgrade to a professional model. The one thing that has stifled most anyone from actually using any of these new and exciting services was the major battery life that the new device consumed. When Apple released their latest operating system through iTunes, owners of the new device reported that they were not getting much use out of the device because of the short life span. As reported by Mashable, the bugs and battery life did not only affect the new iPhone 4S, but older devices like the iPad and iPhone 4. According to the official report from apple as seen on MSNBC's Technolog, the new iOS 5.0.1 upgrade fixes bugs in battery life, allows first generation iPad users to multitask, fixes bugs with documents in the iCloud, and even improves voice recognition on Siri for people with Australian accents. According to a report on CNN, one of the major reasons for the battery drain on the iOS 5 was the prominence of location based apps and GPS trackers. When users simply turned the options off they experienced better battery life, but didn't receive the full experience of the new operating system and the new iPhone 4S. In order to combat negative publicity, the company decided to offer free cases while it worked on the problem. As with the launch of any new device, there are always problems associated with the first versions. If still in beta, the iOS 5 bugs would not have been detected by the relatively small testing base. Now with most of the bugs kinked out, normal users can go about using the new managed server hosting, camera, and voice recognition services without fearing they will miss an important call because of a dead battery. My wife's Droid phone keyboard suddenly stopped working and I am beginning to think there are other people who are having the same problem. Typing on the keyboard is impossible and it stops after a few letters. The arrow key does not work to go back as well. She ran into a few friends also on Verizon and the store and it appears that they are having the same issue. However, this time it was on a Blackberry phone. Is Verizon making changes in their customers settings remotely without telling customers? Is this a big conspiracy to get Verizon customer to upgrade their phone during the Holiday shopping period? I am beginning to wonder if Verizon is tampering with their customers phones in order to make them go into a store and upgrade. Please share your experiences below if your phone settings are suddenly getting changed and causing technical issues. After doing some research on Twitter it appears other customers are having similar issues. See this Twitter search for "Verizon Phone Not Working". Black Friday is night, and the web is crawling with fantastic deals on cell phones and related technology products. Cell phone manufacturers and distributors alike know how competitive the draw for customers is, and they’ve consequently made a great showing this year. For example, Amazon Wireless is offering a selection of Android phones for Verizon, AT&T, and Sprint for just one cent. Admittedly it comes with a contract (that costs more than a cent), but that price is still a steal for models like the HTC Droid Incredible, the Motorola Droid X, and the Samsung Captivate. The T-Mobile MyTouch 3G slide is also available for a penny at Costco. T-Mobile has announced a buy-one-get-one-free promotion on featured smartphones for customers signing up for a two year family plan, and Verizon is giving away their $100 jawbone Icon Bluetooth headset to buyers of select smartphones. Retailers have hopped on the Black Friday bandwagon as well. Best Buy is selling the RIM Blackberry Style for $69.99 ($30 off) and you could get the HTC Evo 4G and Samsung Epic 4G online from Radio Shack for $149.99 and $199.99, respectively. The Samsung Continuum is available at Target at the $120 discount of $79.99, and Quantum Wireless’ Black Friday sales include the YX545 cell signal booster from Wi-Ex zBoost. If you’ve been itching for a new smartphone or other gadget of the sort, now is the time to make good on it. Deals this good only come about once a year, so get on them while they still last. 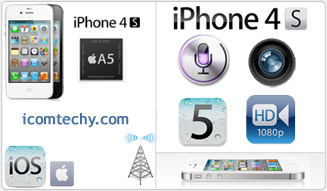 As expected, the new iPhone 4s will be much more powerful than its predecessors. It will have a dual core processor and dual core graphics which will make gaming an even more exciting experience. It will come equipped with the new A5 chip and have a gig of RAM. Vice President of Apple Phil Schiller said that the new iPhone will be up to seven times faster than the current incarnation of the device. There will be even more reason for aspiring photographers to purchase the new iPhone 4s. It is reported to have an 8-megapixel camera that will take shots up to 60 percent larger than before. There will also be a face detector which will allow for better focused pictures. All of the apps with unique photo filters, borders, and effects will become much more relevant. 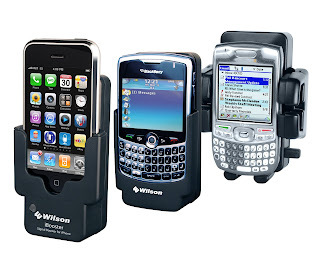 Remember when Blackberry and other PDA systems were the most innovative ways to organize your information? The times have drastically changed and you no longer have to keep your information stored in those clunky mobile devices. With the use of voice recognition technology, Apple will introduce Siri along with the new iPhone 4s. By speaking into the device you can send personalized text messages, perform phone number lookup, remind yourself of errands, and pay bills. Siri essentially lets you perform actions on your phone without even touching it. With the addition of Sprint as a carrier of the iPhone 4s, all major carriers are now involved in Apple's smartphone strategy. Users of Sprint carriers should be a little weary because the company has had to invest so much money into the purchase of the product. Sprint gives another option for consumers, but with Verizon and AT&T having so much market share, will people be willing to shift service plans? Some of these new features seem like things that only techies will be interested in. If you absolutely need to get your hands on the latest Apple product, it will be on pre-order on October 7th. If you are looking to save money or don't have an upgrade option coming up soon, you should stick with your current model. No T-Mobile iPhone a Blessing in Disguise? 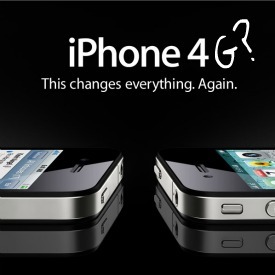 T-Mobile USA management has long made it known that it has wanted to sell the recently released iPhone 4S. Apple flirted with the idea of granting T-Mobile access to the latest installment of its beloved iPhone series but, despite awarding Sprint the rights to the smartphone, chose to not let T-Mobile sell the phone. Is this a blessing in disguise for T-Mobile customers, as other carriers struggling to handle the huge amount of data traffic and network congestion from iPhone customers? 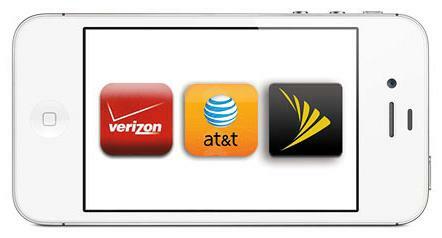 iPhone slow on Sprint, iPhone slow on Verizon or choosing a carrier for iPhone 4S. To add insult to injury, regional carrier C Spire, formerly Cellular South, recently began offering the iPhone on its network, likely leaving the brass at T-Mobile bewildered and their customers frustrated. T-Mobile’s desire to obtain the iPhone is understandable – the 4S which went on sale on October 14, sold 4 million units in the first three days on sale. These numbers broke all previous records and secured the iPhone 4S’s status as the most popular Smartphone on the market. However, all is not lost for T-Mobile USA customers looking to take advantage of all the perks the iPhone has to offer. Apple offers an unlocked version of the iPhone 4S – this means that the phone isn’t SIM-locked to any particular wireless carrier. Thus, T-Mobile customers can purchase mini SIM cards from T Mobile to insert into their iPhone. Millions of T-Mobile customers are jail breaking the iPhone 4. Unfortunately, the unlocked phones aren’t compatible with T-Mobile’s speedy HSPA 3G+ network and users will therefore have to be content with the old 3G network instead. Predictably, the unlocked phones don’t come cheap. The 16GB version is being sold by Apple for $650 a pop, the 32GB version for $750, and the 64GB for $850. Despite these obstacles, T-Mobile enjoys more than a million iPhone customers, an impressive feat for a carrier that doesn’t even carry the iPhone. Alternatively, you can hope that AT&T is successful in their bid to take over T-Mobile. That would make things a whole lot easier. The newest addition to the iPhone line, the iPhone 4S, was released on October 14th and is selling like hotcakes. Now, for the first time ever, the iPhone is not only available through AT&T and Verizon, but on the Sprint network as well. This, of course, begs the question – which provider has the best plan? That depends on the type of data user you are. Each of the three major carriers offer data consumption plans that are geared toward specific subsets of Smartphone customers. For those of us who consume data like it’s water, Sprint is the best bet. Sprint is the only service to still offer unlimited data plans. It costs $80 a month but, no matter how many texts you send or how many web pages you download, that number will remain $80. If you’re not really one for weathering constant streams of data, and you know you’re mobile communication will likely be limited to voice calls, AT&T is probably the wisest choice. For only $55, which is $15 less than any other carrier’s plan, AT&T provides 450 voice minutes and 2 GB of data. In terms of texting, however, AT&T becomes rather steep. Their texting plans are comprised of two options – a 20 cent per text plan or unlimited for $20 a month. Either way, the liberal texter will find himself saddled with a hefty monthly bill. Verizon’s plan was designed as a medium between these two extremes. For a relatively reasonable $75 a month, Verizon customers are allocated 450 voice minutes, 250 texts, and 2 GB of data – a substantial amount that, at the same time, isn’t gluttonous. In terms of speed, AT&T retains a slight edge. Apple engineers have found a way to harness AT&T’s HSDPA bandwidth and apply it to the iPhone 4S. However, while AT&T refers to this standard as “4G,” it is more like 3G+, and improvements in speed are minimal. Verizon has consistently tested as the most reliable network overall, and is thus often the carrier of choice for customers whose main concern is sheer workhorse dependability. In addition, if users of the new iPhone on any carrier have cell reception problems, there are excellent cell phone signal booster options that work extremely well with iPhones. Good luck choosing your carrier. 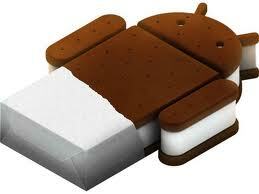 List of new features on Google's new Ice Cream Sandwich Android OS. NFC Near Field Communications aka "Beam"
Real time text for voice to text input aka "Siri"
While we discover new features, please enjoy looking at this tasty desert below. The SDK is now out and available for developers to start working on their applications. Apple (Nasdaq: AAPL) disappoints Wall Street in their latest earning call beating guidance but not matching street expectations. 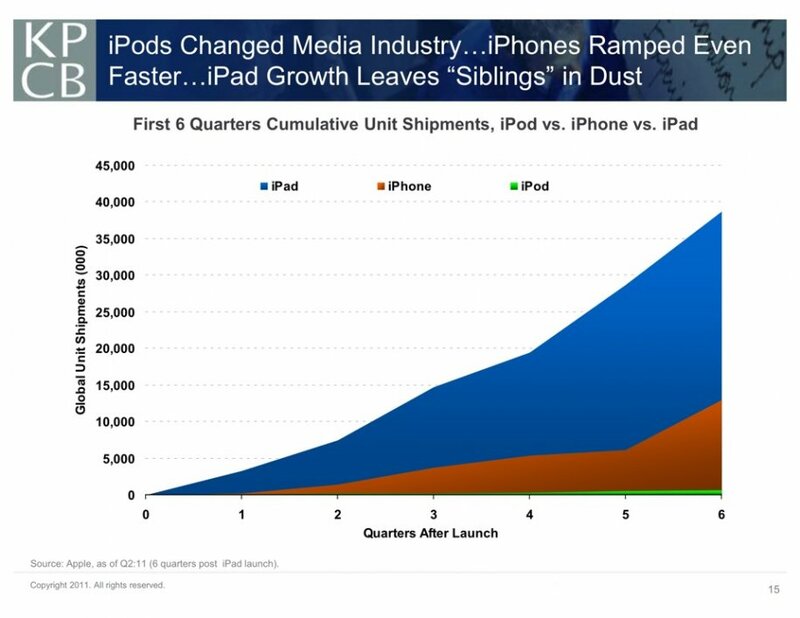 After looking at Mary Meeker's latest Awesome Web 2.0 presentation about the "State of the Web", this slide struck me the most as I listened to the Apple earnings call. Apple's stock has risen over the last few years due to their close business relationships with the carriers and booming iPhone sales. Have iPhone sales topped out due to insanely booming iPad sales? iPads carry lower margins for both Apple and the carriers and have a incredibly better user experience than an iPhone. Once you start using a tablet or an iPad you might only use your smartphone for tethering and essential messaging functions. No longer are the thousands of iPhone applications relevant as the iPad has become the focus of my WiFi content data usage experience. And yes its FREE! 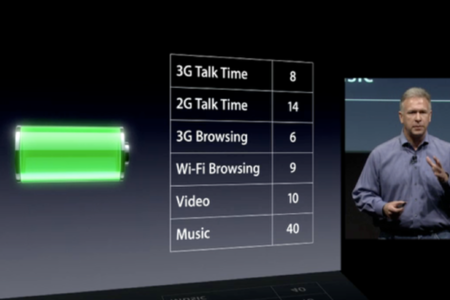 Apple investors have also been expecting the iPhone 5 which technically is 2 years behind the curve on 4G standards. LTE and 4G phones have been on the market for a long time and Apple has not even announced the iPhone 5 yet as it just launched the iPhone 4S. Surely Apple's inability to keep up with the pace of 4G data speeds on phones will catch up with them. Carriers pay Apple handsomely for the right to sell the iPhone because the payback for the customer's data subscription is only in a few months. 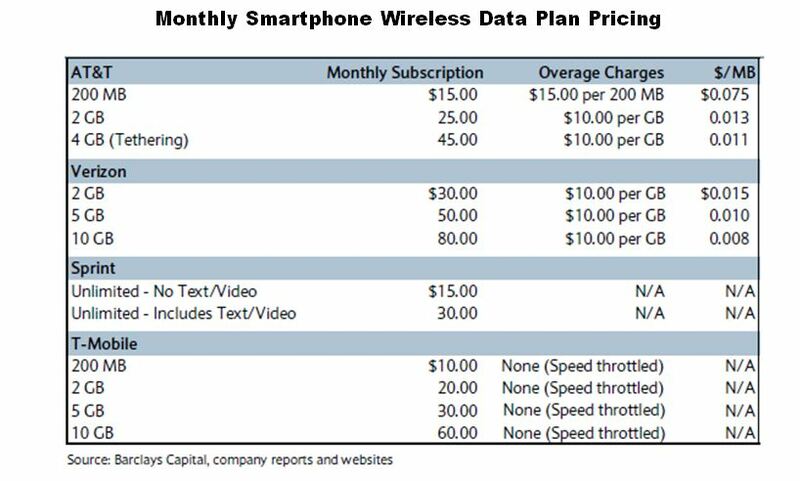 Consumers are paying $50 to $100 for monthly data plan subscriptions and are NOT doing the same with iPads. WiFi only iPad users are growing much quicker than the 3G iPad. This translates into lower margins for Apple with a one time only sale price of $500 that will likely be lowered soon. The current iPad selling at $500 will likely be forced to drop in price due to competition. Amazon announced the Kindle Fire Android tablet at $200 and plan to make most of their money on data / content subscriptions. Other Android tablet manufacturer including Google have grander visions of making money off of location based advertising which Apple is behind on as well. This is the first earnings call since the passing of Steve Jobs where Tim Cook was alone at the helm. Is he setting himself up for a great Holiday quarter? Apple could be sandbagging their next quarter before they release the iPhone 5 or have they run out of momentum? Why is iOS 5 iPhone Update Draining Battery? The iOS 5 iPhone upgrade seems to be having a fair share of about poor battery life after the upgrade is performed. This is not surprising considering most people have lots of application that run in the background and the iPhone is constantly looking for your location and notifications. This is less of a problem on the iPad that has a 10+ hour battery life. The iPhone requires lots of processing power and bandwidth to operate and will ultimately result in few apps being used on the iPhone. This is one of the reasons why we think that the on deck iPhone application industry will start to consolidate and gravitate further to HTML5. Deactivate diagnostic and usage reports. 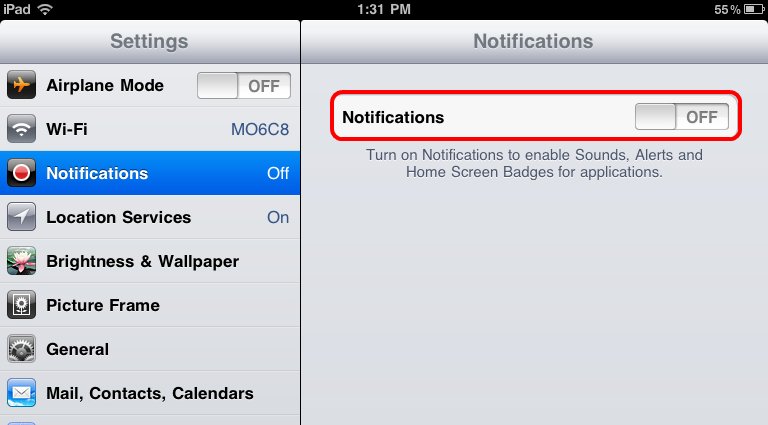 iOS 5 on my iPad has finally fixed the annoying iPad WiFi signal dropping issue. iPad customers have been dealing with the WiFi dropping issue for many months by changing settings on the iPad and the router and none solved the problem up until now. Some customers would find themselves hitting the Renew Lease button under settings multiple times per day without changing the location or leaving the network. The good news is I upgraded my iPad to iOS 5 recently which was free but comes with a price. The upgrade itself will take about an hour and may delete some of your downloaded applications if you are not careful. We recommend that you sync the iPad apps with a Mac or PC first before doing the operating system upgrade. The upgrade comes with a lot of new bells and whistles but the most notable feature is the new Safari tabbed browser which is nice instead of flipping between open pages. I am still a believer in the iPad WiFi or iPad 2 WiFi only versions because I mostly use the iPad at home or in the office. The costs simply do not make sense at this time when carriers have tiered data plans and caps. 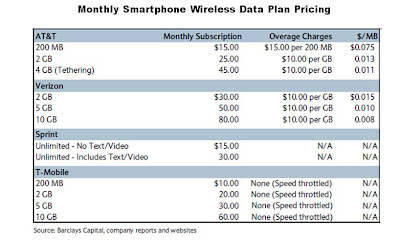 Compare data plan pricing here. When I need to use the iPad out and about I simply tether the iPad to my T-Mobile phone. Is The iPhone 4S 4G? The iPhone 4S is not 4G but it does support both GSM (AT&T & T-Mobile) and CDMA (Sprint & Verizon) networks that are HSPA+ compatible. HSPA+ is much faster than 3G when you are used to a 3G network, however, it is not technically 4G. One thing to note is the iPhone 4S only supports one network at a time and is not 4G. 4S is not technically 4G and does not support LTE nor WiMAX. 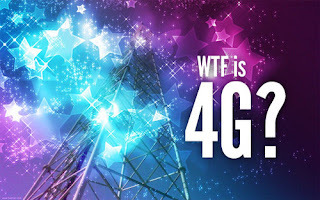 Apple (Nasdaq: AAPL), AT&T (NYSE: T) and Verizon (NYSE: VZ) have done a masterful job of planed obsolescence and also confusing customer about what 4G. It continually amazing me that Apple loyalist continue to buy the iPhone, even though its processor and data connection speeds are clearly two plus years behind other phone manufacturers like HTC, Samsung and Motorola who use the Android operating system. These manufacturers were out with 3G HSPA+ phones 2 years ahead of Apple and are already working on LTE phones. Sprint (NYSE: S) is winning lots of new customers with its unlimited data plan offering at $79.99 per month. Sprint reported today that their sales Apple (iPhone sales are booming and the best in the company's history. Sprint today reported its best ever day of sales in retail, web and telesales for a device family in Sprint history with the launch of iPhone 4S and iPhone 4. We reached this milestone at approximately noon CT/1pm ET. The response to this device by current and new customers has surpassed our expectations and validates our customers’ desire for a truly unlimited data pricing plan. Its not surprising to see since unlimited data plans are a hot button for mobile phone consumers. Other carriers including Verizon and AT&T will charge you extra for going over your data plan, whereas T-Mobile will simply slow you down at the 2GB cap. Most sophisticated iPhone users keep track of their data plan usage through the month. However, there are still very few tools and not much transparency to measure your data usage on phones. Applications are constantly running in the background and using data without your knowledge. More tools and applications needed to be provided. Until recently, two advanced network models dominated the US cellular market: CDMA and GSM (we’ll stick with the acronyms for now; the words they stand for are technical and boring). These are essentially two different standards, requirements that a given network must meet in order to qualify. Verizon Wireless, Virgin Mobile USA, and MetroPCS all use CDMA-approved 3G networks. AT&T, T-Mobile, and many Cellular One networks operate on the GSM standard. So what’s the difference? For the consumer, there isn’t much. Primarily, GSM is widely used globally while CDMA is more popular in the US. International travelers can more easily adapt their phones to foreign GSM networks. The other significant difference lies tucked in the phone itself, usually just under the battery. GSM phones store information on portable SIM cards, allowing you to keep all the settings and contacts from one phone and slip them all into another. You transfer all your data between phones simply by exchanging SIM cards. This is very convenient for upgrades, replacement phones, or if you just happen to like carrying different models depending on the occasion. CDMA stores that information in the phone itself and cannot save or transfer it between devices. People wonder whether a choice between CDMA and GSM affects their coverage. Within their networks, the standards operate equally well. The difference lies in the reach of each network. Some regions of the country are within close reach of CDMA towers but far from GSM towers and vice versa. For those regions, it’s important to determine which carrier (i.e. which network) works best and to go with it. Coverage varies by region and availability, not network standard. Only within the last year, really the last few months, have these network models become increasingly insignificant. These are 3G systems including (HSPA and HSPA+) we’ve been describing, but the next level, 4G networks, are popping up quickly. In fact as we begin to transition, 3G/4G Routers, phones and cell boosters are becoming increasingly common. Verizon has been rolling out its 4G LTE network, already in 140 markets and counting. AT&T has responded with its own 4G LTE network, currently operating in 5 cities. This “next-generation” standard improves data speeds so that you can download or stream as much music and video as you can muster, and do it instantly. 4G systems make smartphones worth it. So, CDMA and GSM are quickly becoming relics of the past. But, for those of us without an iPhone or Droid, they’re still significant and worth knowing more about. iPhone & smartphone users can get very frustrated with the fact that their phones must constantly be hooked up to a charger. Unfortunately, while computer and phone processing power have advanced lightyears ahead in the past fifty years, battery design has only improved slightly. So that's why after one decade into the twenty first century, we still tether our devices to walls or dashboards, still grounded in an atmosphere filled with wireless gadgets. While we can try to picket R&D departments or protest at engineering labs, the best option for now is to try to preserve a smartphone battery power as much as we can. Most people are well-versed in the basic methods of battery preservation and know which smartphones have the longest battery life. Just like any valuable commodity, rationing power on a need basis is always effective. 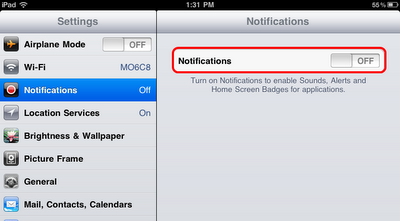 Lowering screen brightness, shortening backlight operation, and keep your calls short. Keeping WiFi, Bluetooth, and GPS capabilities switched on puts a greater drain on batteries even when they're not in use. There're some other useful tips out there that might be more novel - switching a phone from vibrate to a ringtone preserves greater battery power, as well as displaying a black background whenever possible. But in the age of smartphones, we don't want to curtail the use of our special apps and programs. We want to use WiFi, 4G, and Bluetooth, want to download movies and songs at top speeds, and rely on fast connections indiscriminately. There are other ways to boost power without compromising phone operations. A phone uses up a significant amount of power when it's searching for a signal or operates on only a couple of bars. The stronger a signal is, the less power a phone must put into communicating through it. Boosting your signal strength, rather than limiting your phone usage, is a great way to save power. Signal boosters amplify weak signals from the tower and rebroadcast it within a narrow range, kind of like having your own cell tower in your home, office, car, or boat. Not only do boosters improve battery life, they enhance call quality, eliminating dropped calls and fuzzy connections. Use your phone to the max, the way it was meant to be and never accept batteries as forever frail and shivery. 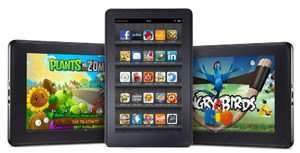 Free 3G Amazon Kindle Fire Android Tablet? Amazon announced today a WiFi only 7 inch Android tablet that it will sell for $199. However, will Amazon's next version of the Fire have free 3G wireless? Amazon allows customers who have the black and white Kindle to access AT&T 3G for free. The next Amazon Fire could have free AT&T 3G for $299 similar to the black and white Kindle for $79. The current WiFi only Fire tablet has a 7 inch screen and weights only 14.6 ounces. The Amazon does not include 3G and you can pre-order it for $199. Shipping date is November 15, 2011. This is a tremendous breakthrough for the industry where the device itself becomes a commodity and the services behind the device become the real value. Subscriptions to content like Pandora, Netflix or Amazon movie become more important and thus will allow Amazon to subsidize the price of the device. It remains to be seen if newspapers can get into the game of require subscriptions to view their content. My speculations is they won't have much success getting people to pay for news and simply will have apps build in this Android platform that are filled with ads. If you compare this device to the iPad 2 its $300 cheaper and does not have the following features. Camera and GPS which are unnecessary for most tablet users. Tablet users are primarily inside the home and office and only need WiFi. Also, if you are a savvy user and have figured out how to tether WiFi devices to your 4G smartphone than the WiFi only version will also be sufficient. 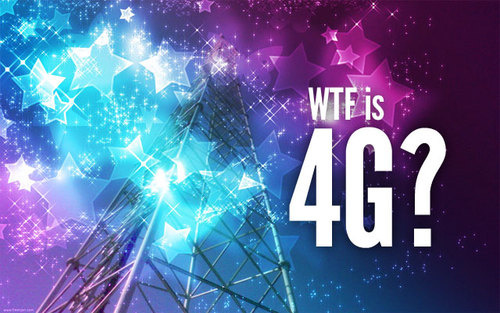 2G, 3G, 4G: WTF is 4th Generation Anyway? Techies throw terminology around all the time, and often we have to pretend that we understand what they're referring to. In this post, we'll try to explain and elucidate some of the tricky lingo used frequently in today's circles. Specifically, we'll look at the G's, 2G, 3G, and 4G - what they are, and what they mean for us. The Gs refer to stages in the development of cellular technology. G stands for "generation." 2G, therefore, means "second generation" cellular systems. Service providers have just begun to roll out fourth generation networks, the most advanced technology developed to date. We'll get to fourth generation in a bit, but let's back up to the beginning, with 1G. The systems retroactively dubbed 1G were the world's first mobile telephone networks. The first 1G network surfaced in Tokyo, in 1979. Over the next ten years, mobile networks were slowly built in countries all over the world. 1G systems communicated with analog signals, using continuous radio waves to transmit information. The analog system was dumped for digital communication with the advent of 2G in the early 90s. The second generation of cell phone technology improved system capacity, allowed mobile data service with text messaging, and lowered the radiation emitted from phones. Much of this was affected by the move to digital communication, swapping continuous analog signals with the short burst, message-style transmissions of digital technology. 2G is still used in many parts of the world today. It would be another ten years before the debut of 3G onto the world stage. 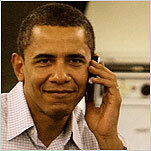 2G systems were strengthened and altered, ushering in mobile internet, video calling, mobile TV, and videoconferencing. Officially, 3G is not a specific technology, but a standard—an outline of specifications for cellular networks. Several different systems have been built that all comply with 3G requirements, such as EDGE, CDMA2000, and UMTS. Different service providers, like AT&T and Verizon Wireless, build and use their own designs for their respective networks. It's the differences in this sort of network structure that define whether or not your phone uses a SIM card. Recently, the wireless communications world has been abuzz about 4G, the latest development of digital communication. The fourth generation standard aims to increase the speeds and thus the capabilities of 3G-enabled tasks, like mobile internet. Before 4G, downloading or streaming movies, songs, or any significant amounts of data to a mobile device was an abysmally slow process, if at all possible. 4G minimizes the difference in user experience between using a top-speed computer and your smartphone. In fact, it's 4G technology that justifies smartphones' existence. "So that was all very nice," you might say, "but how does that affect me?" Well, the sort of technology your phone or mobile device uses will affect what accessories, upgrades, and supplemental systems you can attach and sync with it. For instance, signal boosters, which enhance weak cellular signals, read very specific transmissions. To amplify the weak signal for your 4G phone, you'll need a 4G booster capable of decoding and transmitting 4G signals. It's all quite simple, really. You now have the power to take on those tech nuts and show them who's boss. So you're tired of poor reception, dropped calls, and drained batteries. You know it's time to find a solution and someone recommended checking out signal boosters. But how do you navigate the sea of uninformative model numbers, strange names, and new technologies to find the solution that fits your setup at the most reasonable price? Here's a guide that will outline the factors to remember when going booster shopping. You'll be a cellular amplifier expert in no time. There's one puzzle you should try to solve first, before you start your booster search: Namely, why is my reception so poor? Coverage goes hazy for a variety of reasons. You might live adventurously close to the edge of the network, a good distance from the most far flung cell towers. On the other hand, you might live in a city skyscraper behind thick concrete walls impenetrable to the strongest of cell signals. Or it's possible you live comfortably in suburbia well within cellular range but your house happens to rest at the bottom of an imposing hill, blocking most of the good reception from reaching your residence. Determining the primary obstacle to your cellular experience is key in reaching success with a signal booster. The second puzzle to solve (and this is a lot easier than the first) involves determining how strong your natural, unamplified signal is, both indoors and out. Just open up your phone and check the bars of reception. Signal boosters vary in the degree to which they amplify a signal. Some simply modify a mediocre signal while others totally soup up a dead zone into a power house. So why not go for the biggest and the strongest? Price, of course; those powerful amplifiers come with a hefty price tag for their fancy technology. You want to find the booster that suits your needs exactly to be financially sound and energy efficient. So, you’ve determined why your cell signal is poor and just how strong your unamplified signal is indoors and out, as described above. Now, you'll want to know exactly how much square footage you plan on blanketing with amplified signal before hitting the stores. The signal booster kit contains multiple pieces of equipment that serve different functions. The broadcasting antenna distributes the boosted signal throughout the desired space and these antennas come in a wide spectrum of strengths, each able to cover a different-sized space. Of course, the larger the space, the more powerful and more expensive the antenna. It's important to keep in mind that some websites and product descriptions advertise maximum broadcast ranges that refer to tests set in open territory. However, when those antennas are placed indoors where it must battle through walls, staircases, and other obstacles, the antenna's range reduces significantly. Be sure to get help with an expert from the store to find the true indoor range of these amplifiers. With this easy checklist you'll be way ahead of the game when in the market for a signal booster. Try to look for boosters with the strength you need and antennas to cover the space you want. Remember, asking for help never hurts. There are cell booster experts available to answer specific questions and assist with large-scale installations. With over 25% of US cell phone users now using smartphones, cell phone companies have released new smartphones with features like bigger screens and more apps while leaving one of the most important features as an afterthought… battery life. Because battery life is one of the more overlooked features in smartphones today, we have compiled a list of the top 5 smartphones that have long batter lives. In order to determine the top 5 phones, we researched phones with the highest overall expert rankings from sources like CNET, PC magazine, Wired, and PC world and that also had at least ten hours of talk time battery life. 1. HTC myTouch 4G : The top smartphone on our list was the HTC myTouch 4G because of its overall excellence with an expert rating at 4.37 out of 5, as well as its 10 hour talk time and 432 hour standby battery life. 2. Apple iPhone 3GS : Apple’s iPhone 3GS exceptional talk time of 12 hours can be attributed to its smaller screen that is measured at 3.5 inches, and even though this is the highest on our list, the standby life of the 3GS is a moderate 300 hours. With these features taken into account, the 3GS received an average expert rating of 4.25 out of 5.
time was measured at 11 hours, but its standby battery life was the lowest on the list at 280 hours. moderate standby time of 290 hours. 5. Samsung Captivate : The Samsung Captivate from AT&T comes in at number five on our list receiving an average expert rating of 3.78 out of 5. The talk time on the Captivate is 10 hours with an amazing maximum standby time of 710 hours, which almost twice as much as any other phone on our list. When put in a side-by-side comparison, these smartphones all prove to have great battery life as well as several differences in price and features that will allow shoppers to find the best smartphone that won’t die when their needed most. Why does your iPad constantly lose your WiFi connection? If you are experiencing this problem you probably are visiting the Settings / WiFi / Renew Lease button often to refresh your IP address. This often solves the problem for a short time but if you are a heavy app user the problem continually resurfaces during sessions. We originally posted a solution on how to fix iPad WiFi problem but this solution did not last long. I narrowed my search down to one app that seemed to be causing all of the trouble. 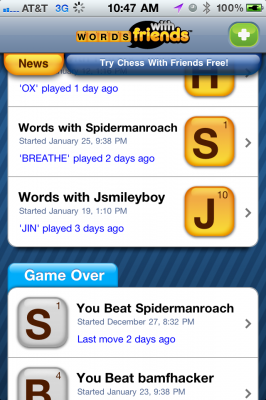 Words With Friends unfortunately, is pinging the network too often and the iPad or the WiFi network seems to get kicked off. Its very annoying but now the iPad works fine but requires me check for game updates and moves manually. This is much better than having to constantly renew lease on the WiFi. All of the U.S. carriers AT&T, Verizon Wireless, T-Mobile and Sprint have announced new wireless data capacity usage plans for their customers. There pricing plans are very fluid and will likely change a lot in the next few months to year. Why are carriers capping data plans? Because there is no money in fixed-pricing and the carriers can make more by charging the heavy data users (like our kids). This is very similar to capping text messaging where your average cost per text goes up to .25 to .35 cents after you go over your text messaging plan allotment. I think this is the new industry scam that must be regulated. It is impossible to think that consumers can trust their wireless carrier to objectively measure their data usage. Currently there are not applications or features on phones to help you manage your usage thresholds. Remember the cases of customers who received the outrageous bills while using their phone and roaming overseas. More transparency is needed for consumers to understand how much data they are using before they can be charged. Data caps are hurting the mobile apps business before it even gets off the ground. Built 54 new cell sites, providing more bars in the area. Upgraded three cell sites, providing faster mobile broadband speeds. Added 138 carriers to increase spectrum on area cell sites, providing extra capacity to reduce dropped calls and improve service quality at busy times. Expanded 301 network connections with fiber lines at area cell sites, helping reduce dropped calls and enable 4G data speeds for compatible devices. Built 14 new cell sites, providing more bars in the area. Upgraded 26 cell sites, providing faster mobile broadband speeds. Added 322 carriers to increase spectrum on area cell sites, providing extra capacity to reduce dropped calls and improve service quality at busy times. Expanded 470 network connections with fiber lines at area cell sites, helping reduce dropped calls and enable 4G data speeds for compatible devices. Upgraded 16 cell sites, providing faster mobile broadband speeds. Added 284 carriers to increase spectrum on area cell sites, providing extra capacity to reduce dropped calls and improve service quality at busy times. Expanded 576 network connections with fiber lines at area cell sites, helping reduce dropped calls and enable 4G data speeds for compatible devices. AT&T customers can see recent network enhancements in the Indianapolis area. An industry first, the microsite gives customers an unparalleled view of what AT&T is doing to enhance the customer experience. Visitors to the new “Focus: Indianapolis” microsite immediately view a map of the Indianapolis area, and are prompted to select the city or town they’re most interested in. The hyper-local map displays specific network enhancements that AT&T has made in the area since the beginning of 2011. Enhancements include new cell sites, broadband speed upgrades, capacity upgrades and network connection upgrades. Following updates on Twitter @ATT_Indy. Built six new cell sites, providing more bars in the area. Upgraded one cell site, providing faster mobile broadband speeds. Added 126 carriers to increase spectrum on area cell sites, providing extra capacity to reduce dropped calls and improve service quality at busy times. Expanded 203 network connections with fiber lines at area cell sites, helping reduce dropped calls and enable 4G data speeds for compatible devices.